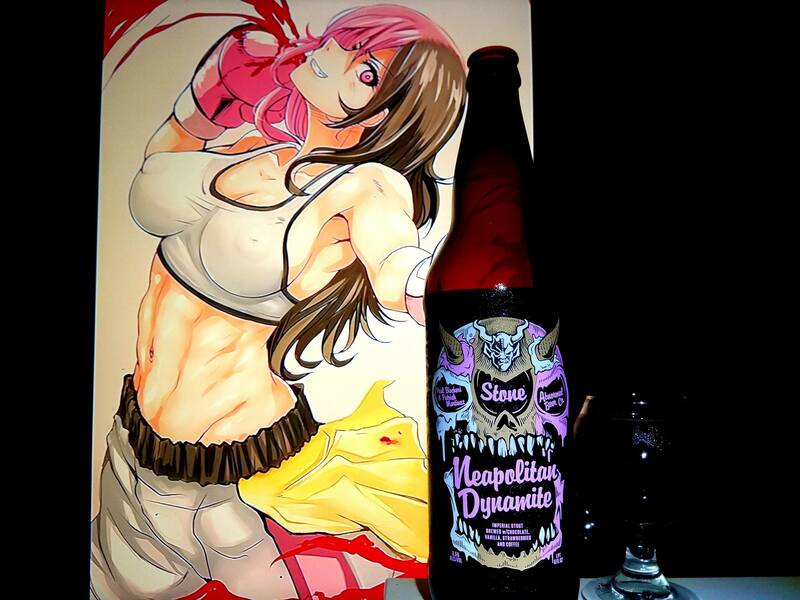 Neapolitian Dynamite collaboration by Stone Brewing, Abnormal Beer Co, Paul Bisckeri and Patrick Martinez is an 8.5% ABV Imperial Stout brewed with Chocolate, Vanilla, Strawberries and Coffee. 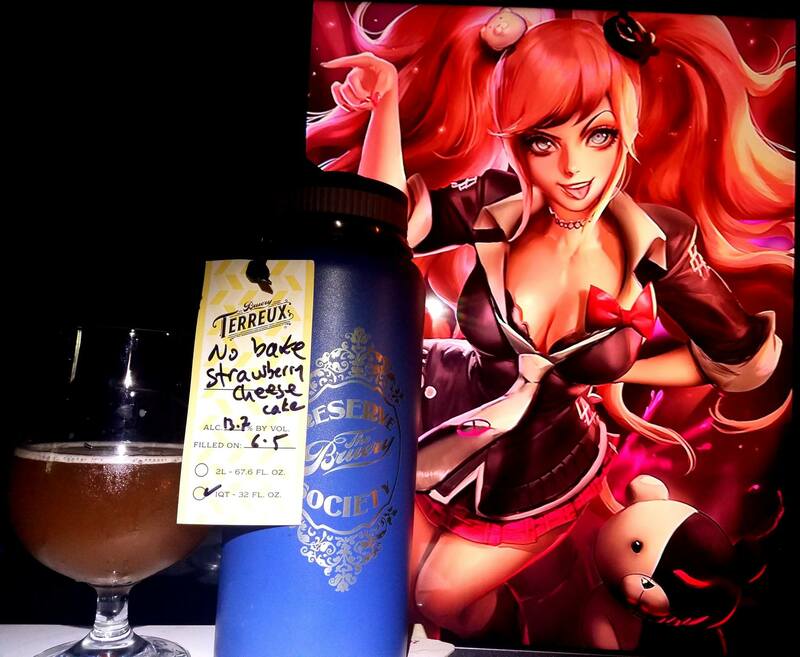 Quite possibly, the next Xocoveza, or so I have heard, this beer was totally unespected. 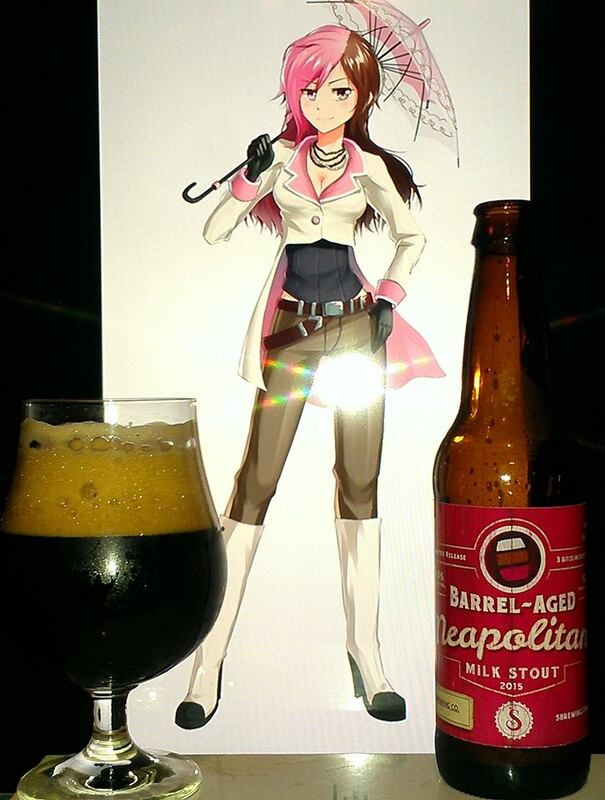 The last time I had a Neapolitan beer, aside from the Lost Abbey collab Stone did which was really close to Neapolitan ice cream, is the Neapolitan Bourbon Barrel Milk Stout from Saugatuck brewing. Granted that beer was so damn amazing, I wouldn’t think I would see another Neapolitan beer for a while. Man was I wrong. So much so that when I saw they were having it release soon, I had to take a 2 hour mission on the bus to Pasadena to get this beer and bring it to the site ASAP! Yes, it is the 1st of September 2017 and I’ll be one of the first reviewers of the beer before it hits the public. So aside from the enticing label and the fact that this is supposed to mimic Neapolitan Ice cream, let’s have a deeper look, cheers! Dark Chocolate, milk chocolate, German chocolate, Bakers chocolate, chocolate Abuelita Mexican chcoolate, vanilla, chocolate doughnut glaze, strawberries and cream, roasted coffee, Irish cream coffee, strawberry and chocolate milk shake, fruit cake, dark fruits, roasted barley and spicy earthy notes. Neapolitan Ice cream galore! Dark semi sweet chocolate, milk chocolate, Baker’s chocolate, German chocolate, Belgian chocolate, dulce de leche caramel, dark fruit raspberries, currants, raisins, cherries, strawberries, chocolate dipped strawberries, triple chocolate cake, chocolate, fancy coffee, roasted coffee notes, roasted barley, Danish cream, Irish cream, steamed milk, honey, maple syrup, toasted coconut hints, malted strawberry chocolate milk shake, chocolate glazed strawberry cream filled doughnuts, spiced coffee, clove spice, bananas, anise, dark fruits, hazelnut nectar, flan, three milks/3 leches cake, cookie dough ice cream and cotton candy. Finishes with Doughnut notes, strawberry chocolate cordials, vanilla cream, Mexican chocolate, earthy hop hints, banana notes, fancy coffee, cotton candy, fruit cake and dark fruits. No alcohol in the taste. Pitch black dark body, smooth, creamy, velvety and chewy mouthfeel and sipping drinkability. Damn decadent and exceptional. It is not a sugary caramel bomb but damn, that balance of dark chocolate with the roasty coffee flavors is closely tying even some Doughnut flavors into the already blissful Neapolitan Ice cream flavors this thing gives. Holy jeebuzz, this is too damn amazing. So much so that one could possibly drink the whole bottle in one sitting. Oops! But that’s what happens with liquid ice cream/pastry beers like these. Make sure you get several, I highly recommend this one! 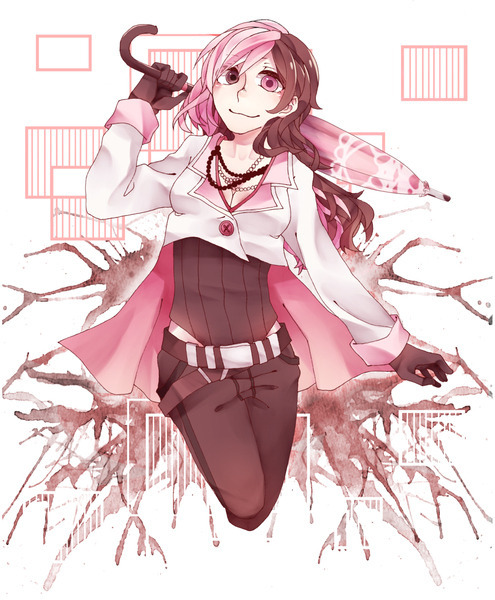 Neopolitan from RWBY makes a return to the Stone side mainly since she is the only character that is literally, the embodiment of Neapolitan Ice Cream, hence, her nick name of Ice Cream Girl. 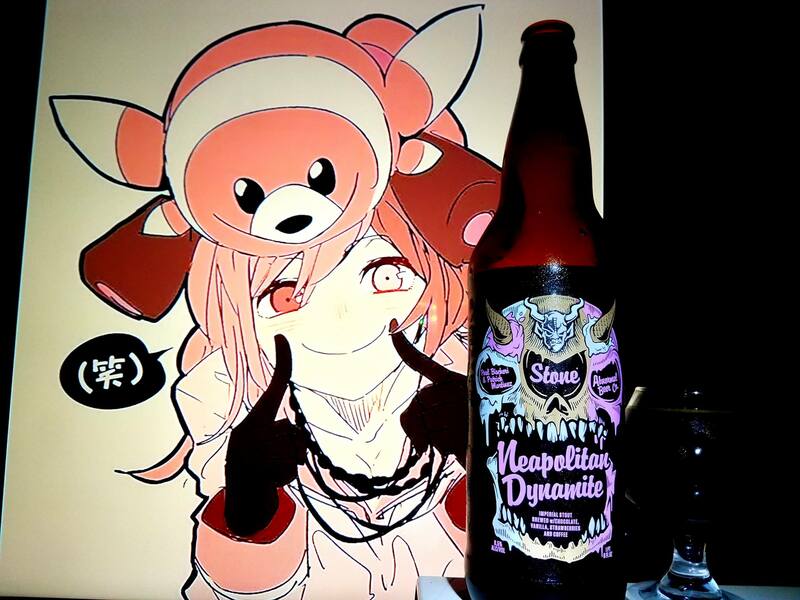 There really isn’t much to explain why she fits this beer so well. 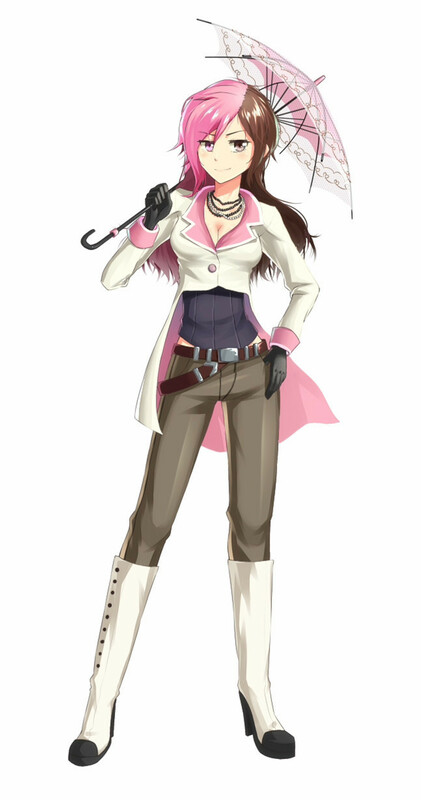 About the Dynamite thought, this girl has huge sass for being the silent type, she really can make things go BANG!!! 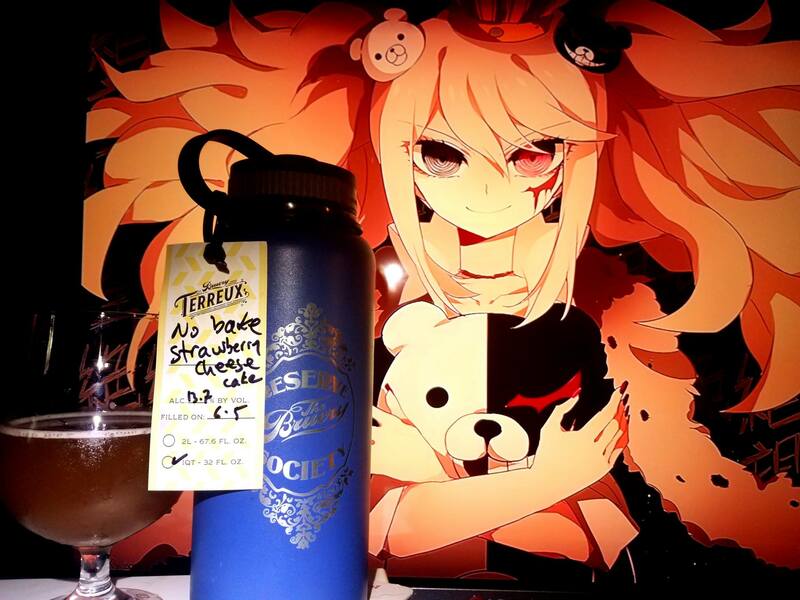 No Bake Strawberry Cheesecake by The Bruery is a 13.7% ABV Wheat Wine brewed with Strawberries, Lactose and vanilla beans aged in bourbon barrels. Gotta admit, the Bruery has been coming out with some of the craziest dessert and delicious experiments ever. 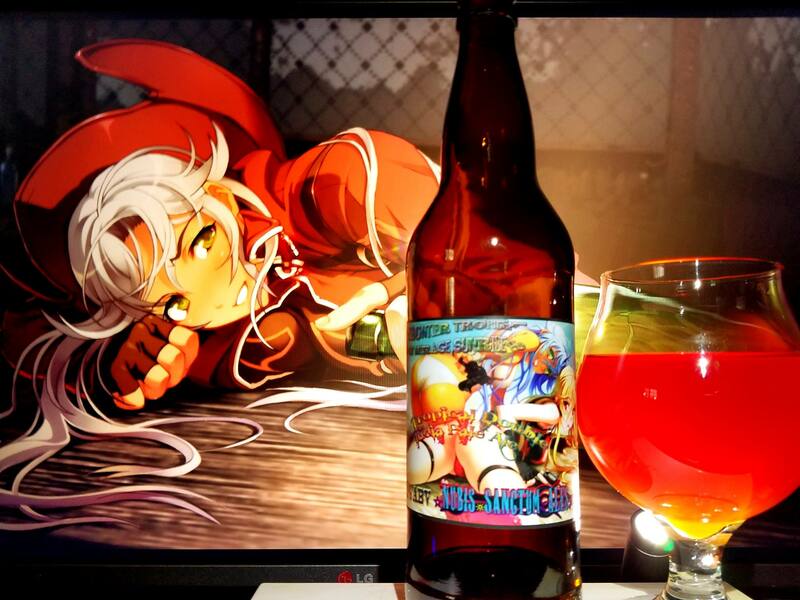 Who would of thought that they would of made a strawberry shortcake beer!? Well, actually, it shouldn’t be surprising! At this point, the Bruery can literally make any type of dessert beer it seems and meant it to how it tastes. This was something that was released on tap only as far as I know but yes, it was one I was allowed to bring home to get a good analysis of. So let’s check it out, cheers! Banana split, strawberries, cherries, biscuit bread, butterscotch, tres leches cake, Danish creak, dark fruits, sweetened condensed milk, Neapolitan ice cream, piloncillo sugar cone, dulce de leche caramel, milk chocolate, toffee, waffle cone, almond joy and toasted coconut. Rich strawberry cheesecake, white chocolate, Strawberry shortcake, Tres Leches strawberry cake, Banana Split with Strawberries, Strawberry and banana yogurt, toffee, piloncillo sugar cone, Cadbury caramel cream eggs, flan, crème brulee, Danish cream, cookie dough ice cream, vanilla, sugar cookies, sweetened condensed milk, strawberry pound cake, Neapolitan ice cream, Strawberries and cream, Raspberries, pomegranates, dark fruit currants, blueberries, dragon fruit, cherries, marzipan, chocolate truffles, toasted coconut, almond joy, cotton candy and red velvet cake. Finishing with rich strawberries, vanilla, cheesecake, cherry, yogurt, marzipan, white chocolate, flan, bananas and caramel. No alcohol in the taste, super hazy murky peach colored full body, smooth, creamy, refreshing and chewy mouthfeel along with a sipping drinkability. Exceptional! Another awesome dessert that feels like liquefying a strawberry shortcake and drinking it. Of course it is amazing and since it uses White Oak as its base, its works super awesomely. In fact, the base was also used in White Chocolate so its no wonder that it has application in making other amazing beers. I absolutely love it. If you get a chance to have this on tap, check it out, I highly recommend it! 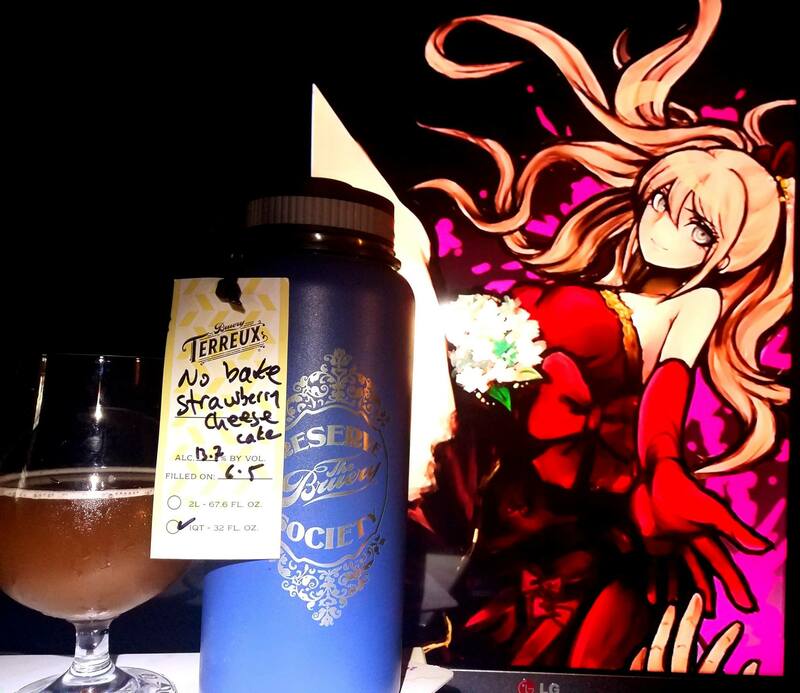 Junko Enoshima from Danganronpa was chosen in this pairing as I was going for something that would fit with pink strawberry cheesecake. 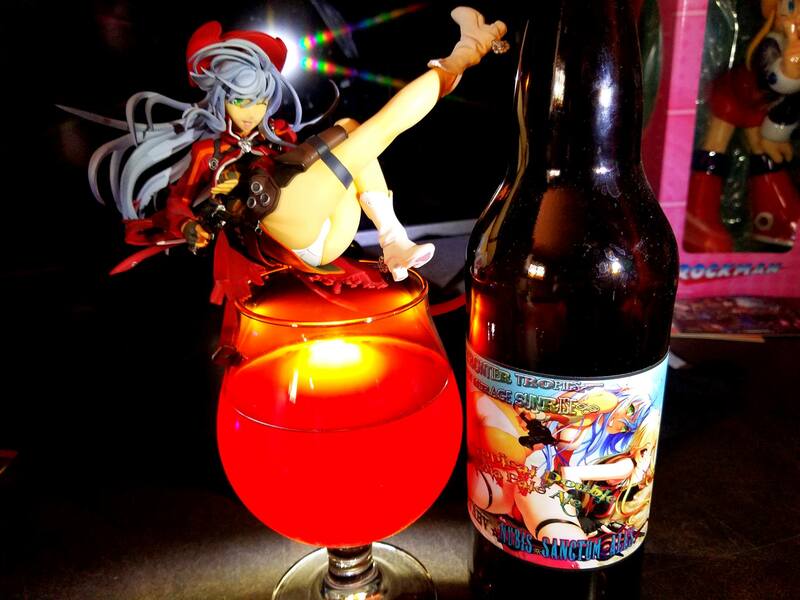 While I already used Sakura Haruno with different Bruery beers as they relate to cherries, I wanted to go with another character that works with this pairing and that is where Junko came in. 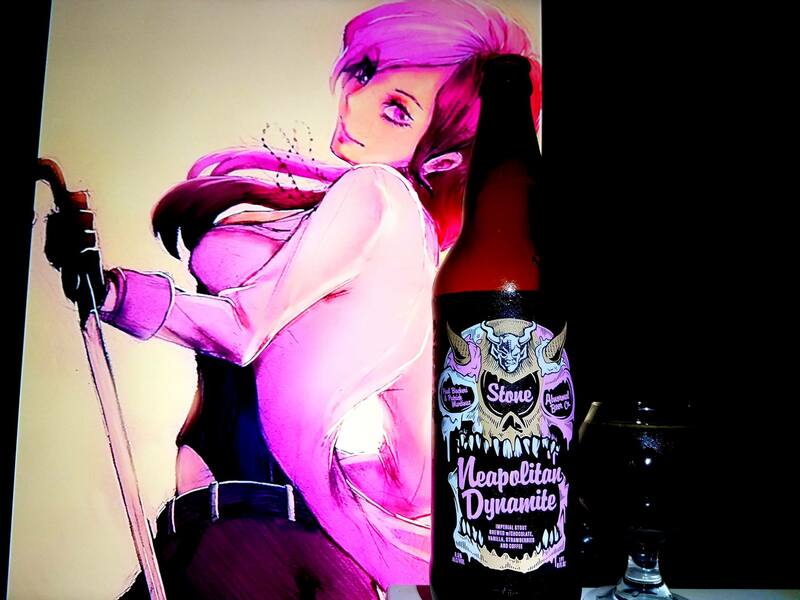 While I do not know much of the story, I do know that she made the perfect pairing in this beer especially over the flavors and ingredients of this beer. 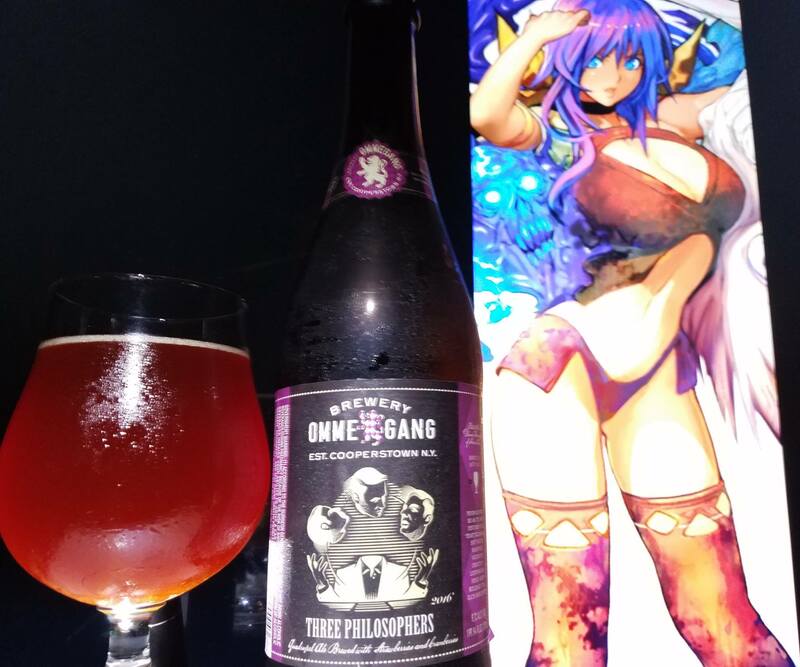 Strawberry & Cranberry Three Philosophers by Brewery Ommegang is a 9.7% ABV Belgian Quadrupel brewed with Strawberries and Cranberries. Once this beer was a dream, not quite finished. Like a symphony missing a line. A quadrupel, for nights of deep thinking, and we thought it was perfectly fine. But we wated much more, so we pondered a while. We brewed on but our minds would not cease. Once we used cherries, and now, other, other lovely berries and Eureka! A dark Masterpiece! This unique version of Three Philosophers unites caramel and chocolate notes of our malty quadrupel ale with strawberries and cranberries, for new complexities to invite your deepest consideration. 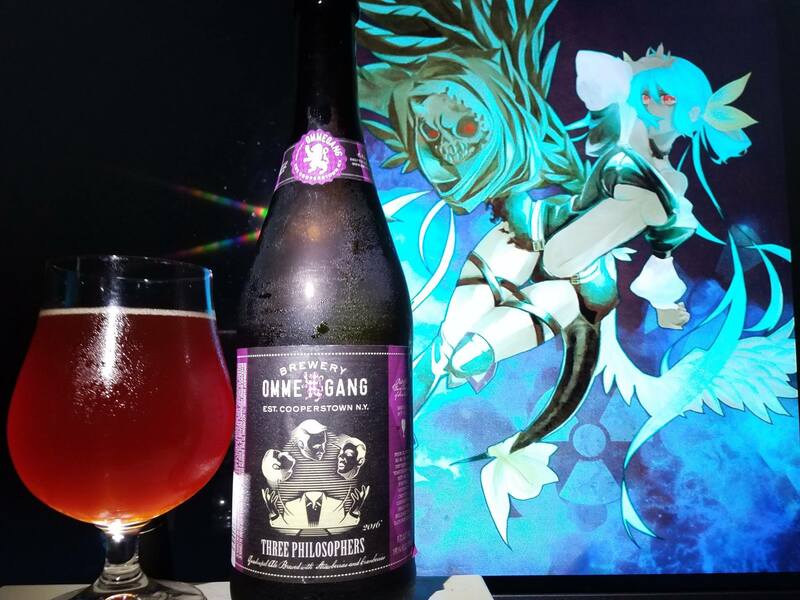 Since the first time I have tried Three Philosophers, it has been till this day, one of my top favorite “common” beers in the world. Essentially right next to St. Bernardus abt 12 and Trois Pistoles. While I think even after this one, that beer will remain a favorite of mine, there is no doubt in my mind, that a first bottled variant of the original brings me so much joy, it is ridiculous. The original base beer was a quadruple and cherry kriek hybrid. This one, I am not sure what process they went with. Whether they blended a strawberry and cranberry lambic or just made a pure quadruple and brewed it with the fruit, I am not sure. One thing is for sure, Ommegang is one of my favorites when it comes to Belgian style brews. I have yet to go wrong with their beers. 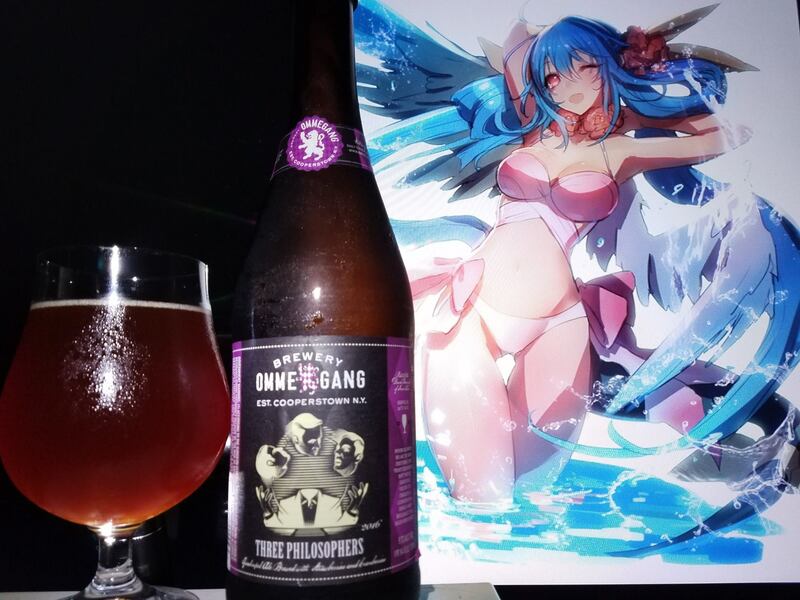 So with that said, cheers to a new variant of the Three Philosophers! Dark fruit cherries, raspberries, raisins, figs, dates, plums, prunes, currants, blackberries, Strawberries, cranberries, dark chocolate, milk chocolate, strawberry cake, chocolate pomegranates, chocolate raisinettes, wine grapes, port wine, dark candi sugar, pecan pie, dulce de leche caramel, mixed berry preserves on rye bread, berry yogurt, bananas and clovey phenolic notes. Rich strawberries and cranberries, wine grapes, port wine, dark candi sugar, rock candy, Pan dulce Mexican sweet bread, Dulce de leche caramel, vanilla, capirotada (Mexican Bread Pudding with raisins), dark fruit cherries, raspberries, raisins, figs, dates, plums, prunes, currants, blackberries, dark chocolate, milk chocolate, strawberry cake, chocolate pomegranates, chocolate raisinettes, pecan pie, cinnamon, flan, piloncillo sugar cone, bananas, clove spice, stone fruit peach, mango, mixed berry yogurt, marshmallows, citrus and mixed berry preserves on toasted rye bread. Finishes with lots of rich dark fruits and mixed fruit flavors, vanilla, bananas, marshmallow smores, dark chocolate, earthy notes and rich dark candi sugar. 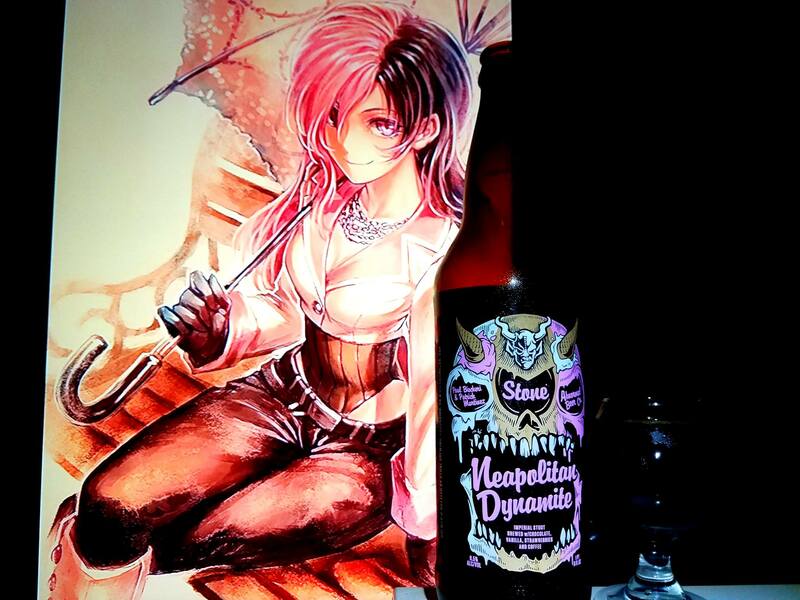 No alcohol in the taste, bloody crimson body, smooth, cream, velvety and chewy mouthfeel along with a sipping drinkability. Exceptionally awesome! Definitely up there with some of the best quads I love including the newer fruited quads I have tried like the Fig and raspberry quads from Figueroa Mountain and Mikkeller respectively, as an example. There is so much going on here ranging from the sweet dark fruit, chocolate and caramel flavors to the mild tartness brought by the fruit mix. As I mentioned before, while this one and the original are awesome in their own right, the fact that the original is my favorite, I will keep it that way. Still, this is a high recommendation for those that love Belgians and Quads! 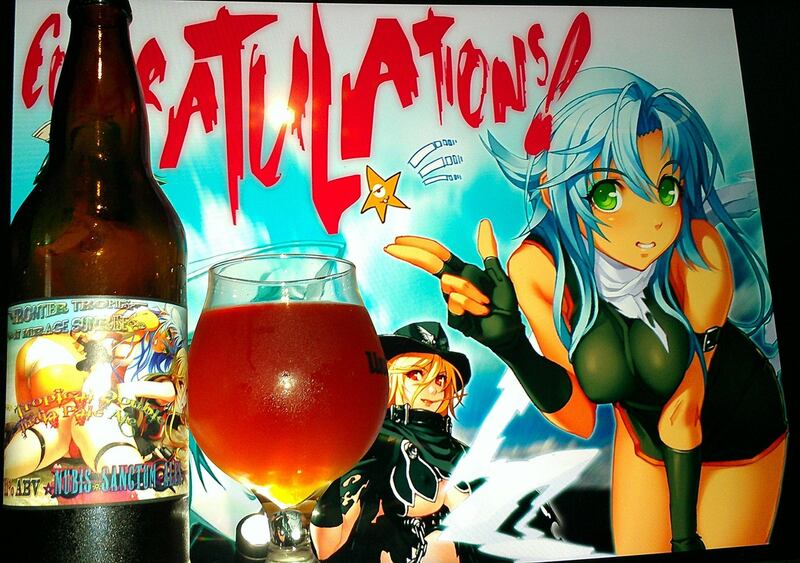 Dizzy from Guilty Gear was brought back to represent the Three Philosophers as she did with the last beer. Essentially, she is one philosopher and the wings are the other 2 philosophers. 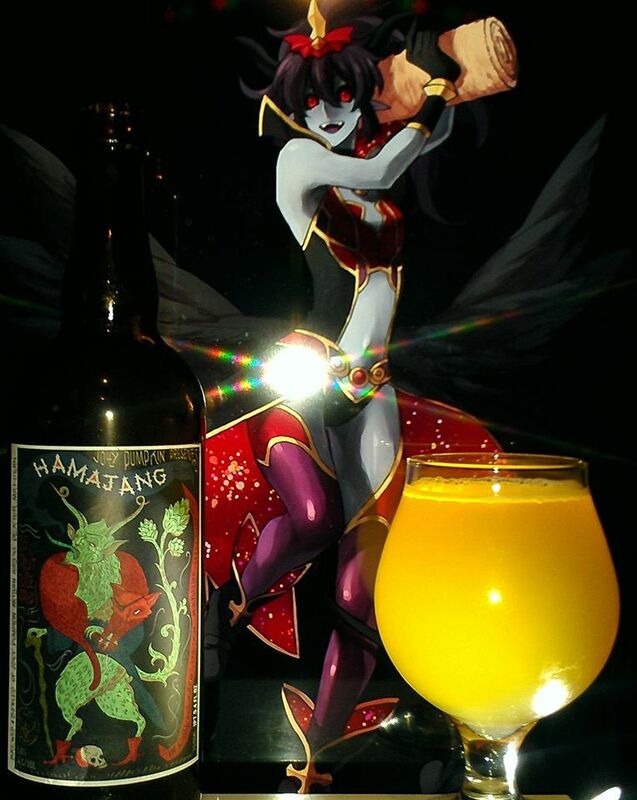 This time however, I wanted to bring her with colors that would represent well with the new fruit additions to the beer. Still an awesome pairing to go with. 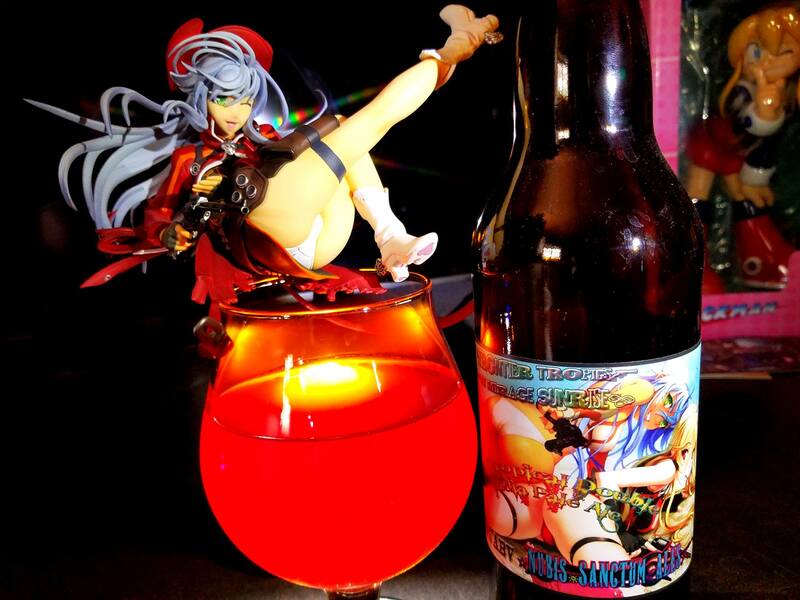 Frontier Tropics At Mirage Sunrise by Nubis Sanctum Ales is an 11% ABV Tropical Double India Pale Ale Brewed with, Citra, Cascade and Summit hops, Toasted Coconut, Strawberries, Kiwis, Mangos, Oranges, Grapefruit, Limes and Coriander. Tropical Double India Pale Ale Brewed with, Citra, Cascade and Summit hops, Toasted Coconut, Strawberries, Kiwis, Mangos, Oranges, Grapefruit, Limes and Coriander. Project #25 was technically a last minute creation for the end of spring 2016. You see, I cannot brew beer in the summer as the temperatures in my room are not viable for brewing. However, since my friend Richard Avila of Avila Ales gave me a birthday present, basically the ingredients to make a cascade and summit double IPA, I decided to take my own crazy and twisted approach to the base recipe and create something awesome. 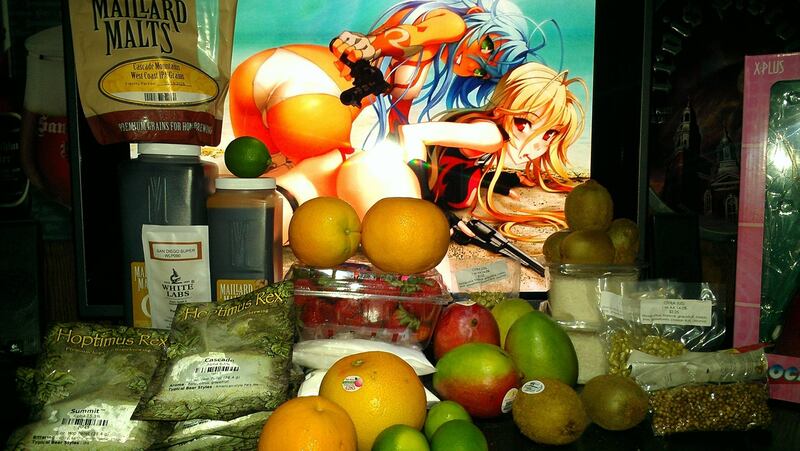 Since I always wanted to make a more tropical IPA ever since last year’s IPA I made, I decided to buy all sorts of fruits that would not only compliment the citrus and grapefruit flavors of cascade and summit but also the tropical fruits in citra which is the other set of hops I added. The origin of the name really came from the use of hops like Summit like in the mountains of the Frontier of the old west. While many are stuck in the dessert in the old west, they desire water and often would find an oasis in the distance only for it to be a mirage. Hence if they ever got to the oasis, it would be like reaching a tropical beach full of delights. 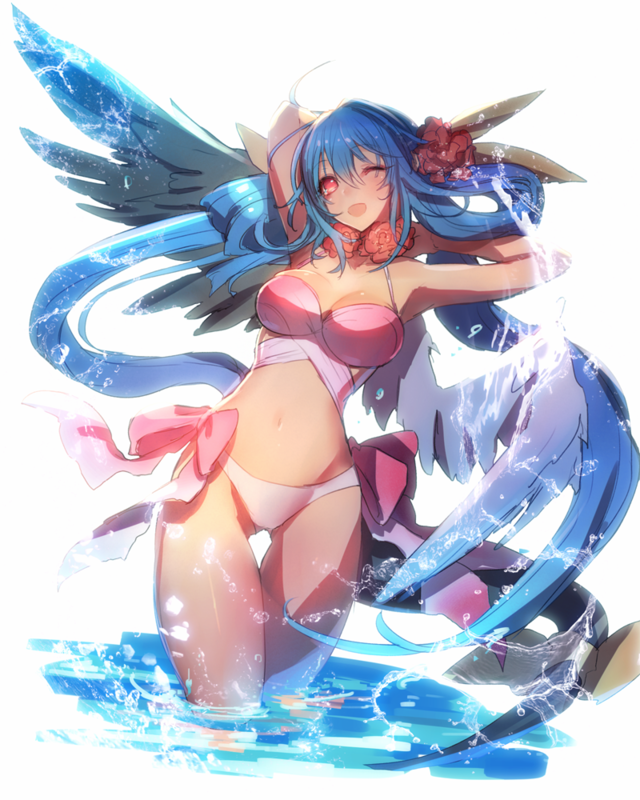 The water would also trickle form the mountains into this paradise tropical oasis, hence the use of the cascade. So all and all, the name came to be, Frontier Tropics At Mirage Sunrise. 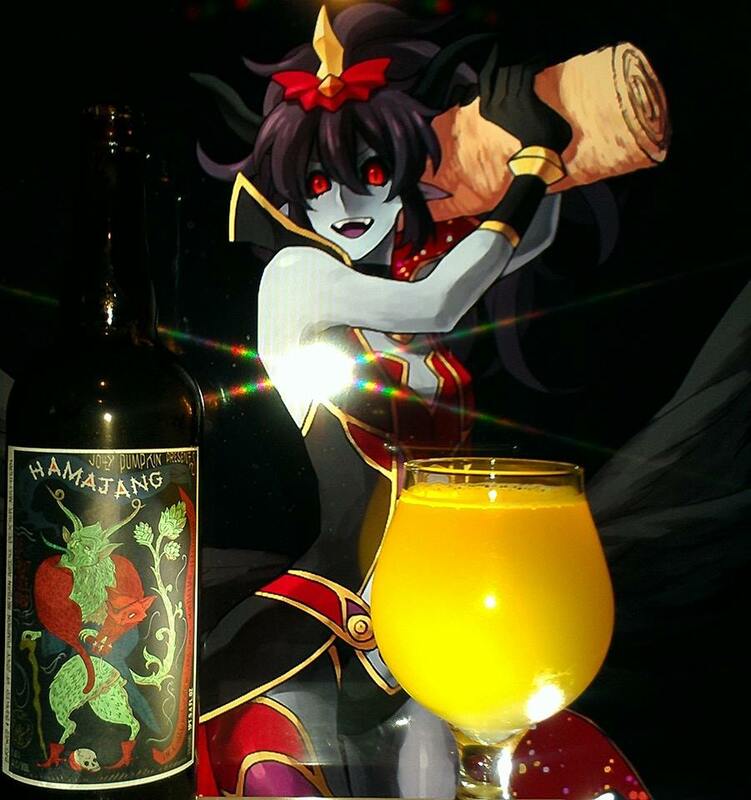 The sunrise part is all the citrus added since it would also remind one of drinking orange juice for breakfast, Nevertheless, this beer came to be. There was a lot of trial and tribulations since I had not used toasted coconut before and so this would be my first attempt. So let’s take a look at the final beer that was made at the end of spring and ready to drink in the summer time, Cheers! Rich toasted coconut, piña colada, macaroons, Tropical fruit pineapple, kiwi, mango, dragon fruit, honey dew melon, vanilla, biscuit bread, agave nectar, honey, kiwi jelly, Oranges, orange juice, limes, lemon peel, tangerines, grapefruit, piney, grassy and herbal hops, coriander hints, strawberries and sweetened condensed milk. Rich Piña Colada, toasted coconut, macaroons, rum notes, tropical fruit kiwi, mango, dragon fruit, mild passion fruit, pineapple (even though there isn’t any added to the beer), strawberries, strawberry cream pie, sour hints of lemon peel, Oranges, orange juice, limes, tangerines, grapefruit, piney, grassy and herbal hops, hint of coriander spice, stone fruit peach, apricot, earthy hops, flan hints, sweetened condensed milk hints, caramel hints, vanilla, biscuit bread, agave nectar, honey notes, honey comb hints and kiwi preserves. Damn perfect fruity and tropical IPA. My only gripes would be that since this is my first time toasting my own coconut, it changed the color of the beer to a brown color but other than that it was awesome. I think the fruit may have over taken some of the hops but the hops really did compliment the fruit and the bitterness is there with a hint of tart from the citrus fruits and kiwi but then rounded off by the delicious and pleasant coconut. Overall, I think it came out great but I think next time I would probably add more hops just because and buy already toasted coconut as toasting the coconut by baking it in the oven changed the color which then changed the color of the beer. This toasting though would work great for darker beers and even if it is a browner IPA, still taste perfect to me. One of my best! Franco iL Nero and Donne Anonime from Nitroplus series, Outlaw Django Tre Donne Crudeli were used in this pairing as I wanted to have not just the colors of the different ingredients complement as well as the flavors, but the theme of I was going for when I came up with the name revolved around the images of Franco and Donne at the beach which was pretty damn creative. 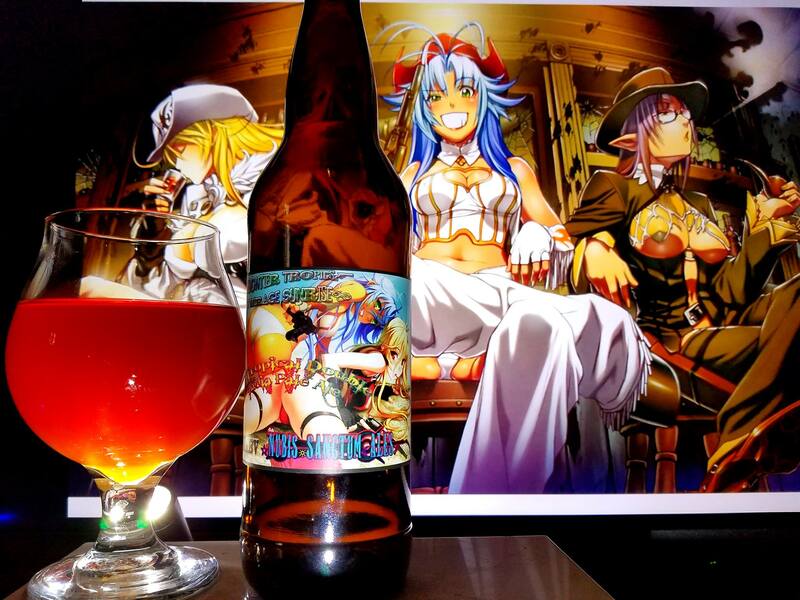 Thus, the story beer complements the art, the other side of the pairing viewpoint! 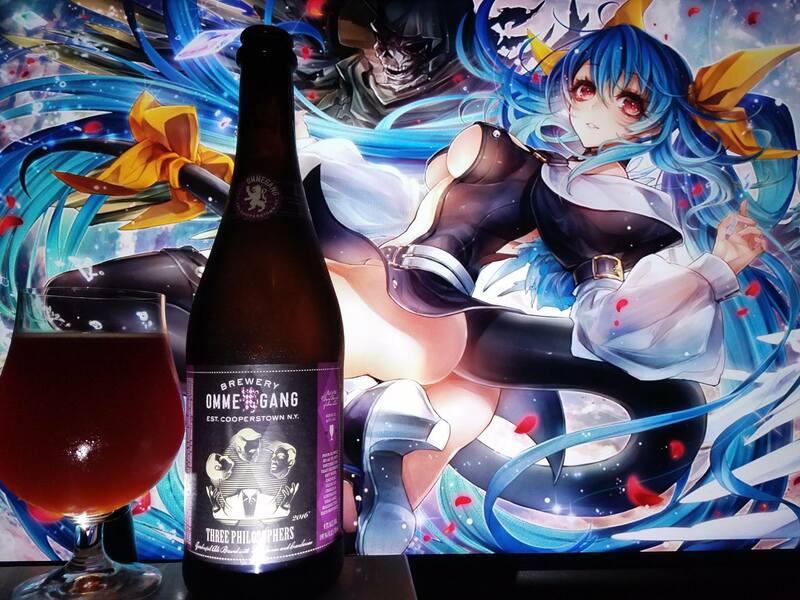 HAMAJANG collaboration by Jolly Pumpkin, Evil Twin, Mikkeller and Leelanau brewing is a 5.8% ABV American Wild Ale Blend with SeabuckThorns/Seaberries and Strawberries. That’s right, I blended them. This brew is a blend of “Sea Buckthorn Fandango Sour Ale” which is a sour ale with Sea Buckthorn Juice and was a collaboration with Mikkel Bjergs of Mikkeller Brewing and Jolly Pumpkin. 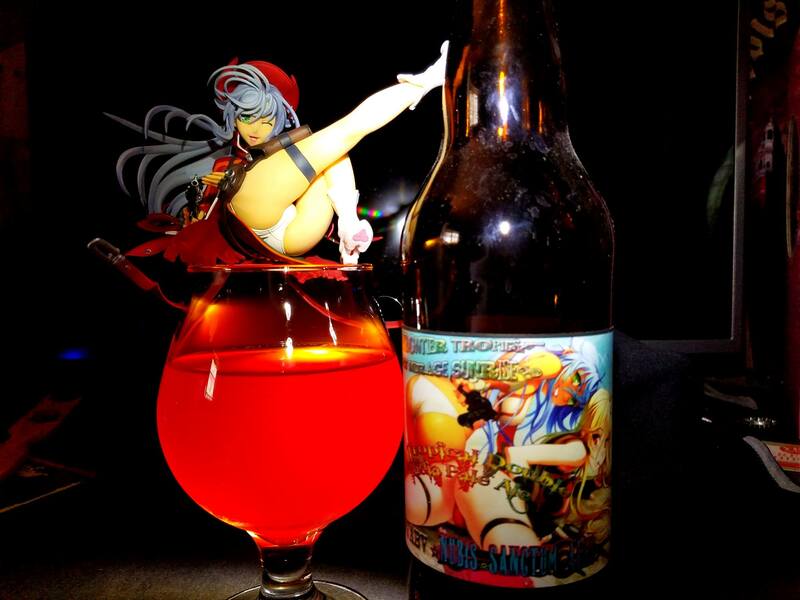 The other being “Innovatorman Sour Ale” which is a sour ale with Strawberries. This collaboration was with Jeppe Bjergs of Evil Twin Brewing and Charles Psenka from Leelanau Brewing Company. I do believe there has been a rivalry between the twins (Mikkeller and Evil Twin) so in order to make this brew which shouldn’t even exist, Jolly Pumpkin blended those 2 beers together and now we have the Hamajang Sour Ale Blend. Sneaky sneaky but awesome. I really wonder what the twins thought of this or even if they agreed upon it. It doesn’t matter though. We have the beer here now. Hamajang is Hawaiian slang that translates into “That’s messed up bro.” So it fits so damn well in the context of the collaboration. For the first time a brew with both their names. Let’s see how it is, cheers! Stone fruit apricots, peaches, peppercorns, honey, farmhouse hay, strawberries, grapes, tropical fruit kiwi, guava, passion fruit, dragon fruit, mango, lychee, lemon peel, lavender and hibiscus flowers. Funky farmhouse hay, peppercorns, bananas, clove spice, floral hops, hibiscus flowers, lavender, oranges, lemon peel, Strawberries, Cranberries, grapes, wine grapes, tropical fruit kiwi, guava, passion fruit, dragon fruit, mango, pineapple notes, lychee, honey dew melon, prickly pear tunas, stone fruit apricots, peaches, honey, coriander spice and clove spice. Finishes dry with Tropical fruit, honey, funky hay, wine grape hints and stone fruit. No alcohol in the aftertaste, pale gold clear body, effervescent, crisp and refreshing mouthfeel and easy to moderate drinkability. A perfect saison in my opinion with enough sour and funky notes to make it interesting. 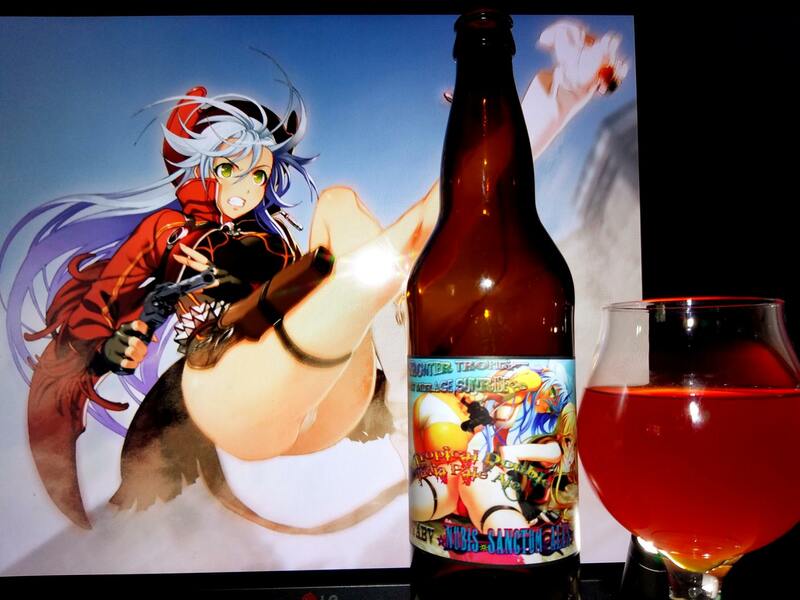 The variety of berries and complex fruits make this quite the unique brew. The label alone was enough for me to get it but just having it, I would definitely want to try it over and over again. I wonder what the brothers would do if they really did do a true collaboration. Only time will tell. 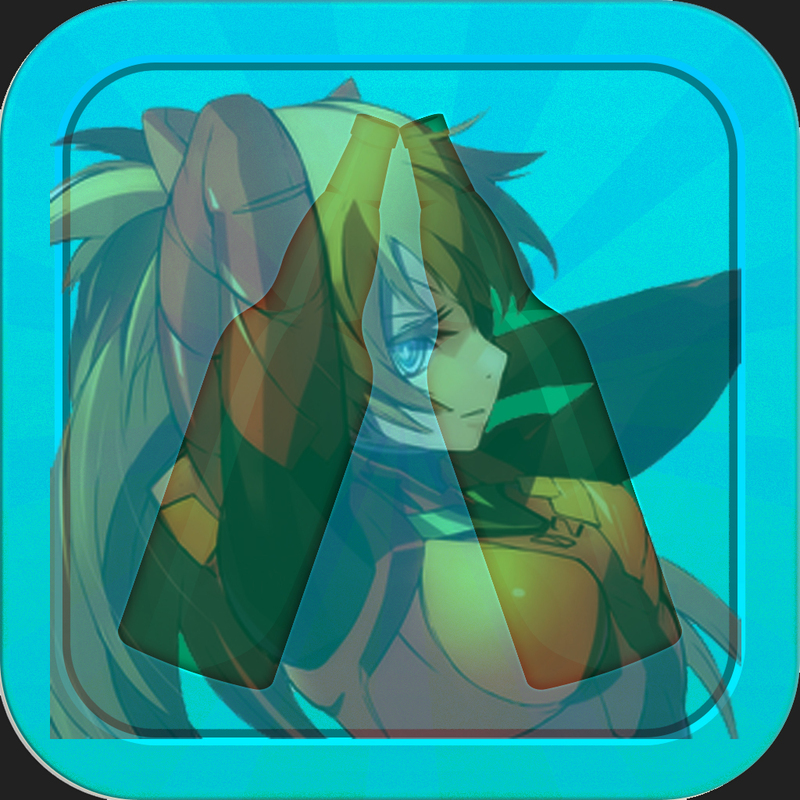 For now, do yourself a favor and get this possibly once in a lifetime collaboration! Mephistopheles from Shinra Bansho, Daena and Sierra from Legend of Mana and furry character Kisha were all used in this pairing to represent the devil and the red cat from Jolly pumpkin. With Daena and Sierra representing the twins as well. 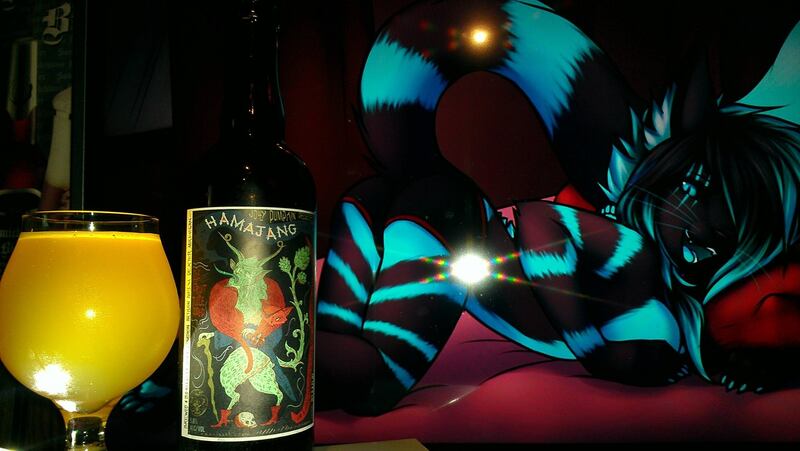 In the case with the dark cat, I like how some of the colors go along with the hop demon and the red for the red cat. 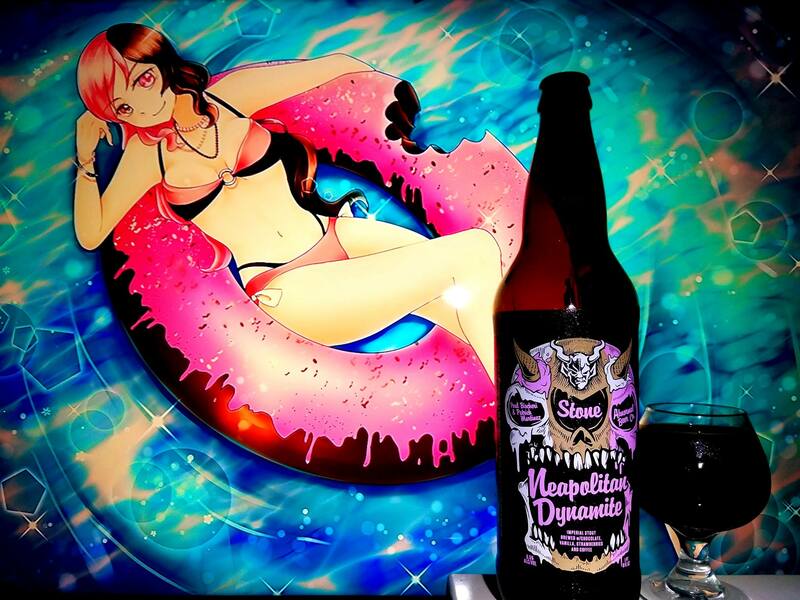 Barrel Aged Neapolitan Milk Stout by Saugatuck brewing is a 6.5% ABV Sweet/Milk Stout brewed with chocolate, vanilla and strawberries double barrel aged in Woodford Reserve and Heaven Hill bourbon barrels. 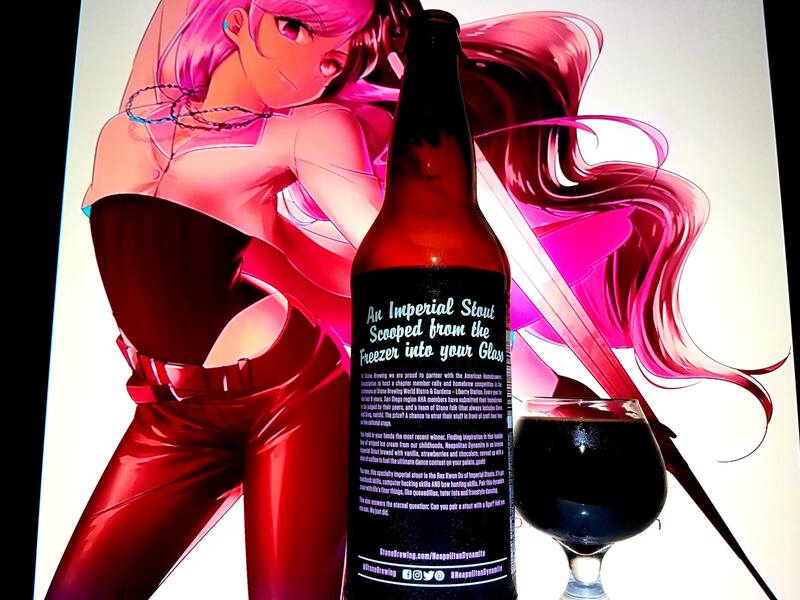 Barrel Aged Neapolitan Milk Stout, a full-bodied milk stout with chocolate, vanilla and strawberry added during brewing……the beer you know and love now aged in a mixture of Woodford Reserve and Heaven Hill Barrels for 9 months. 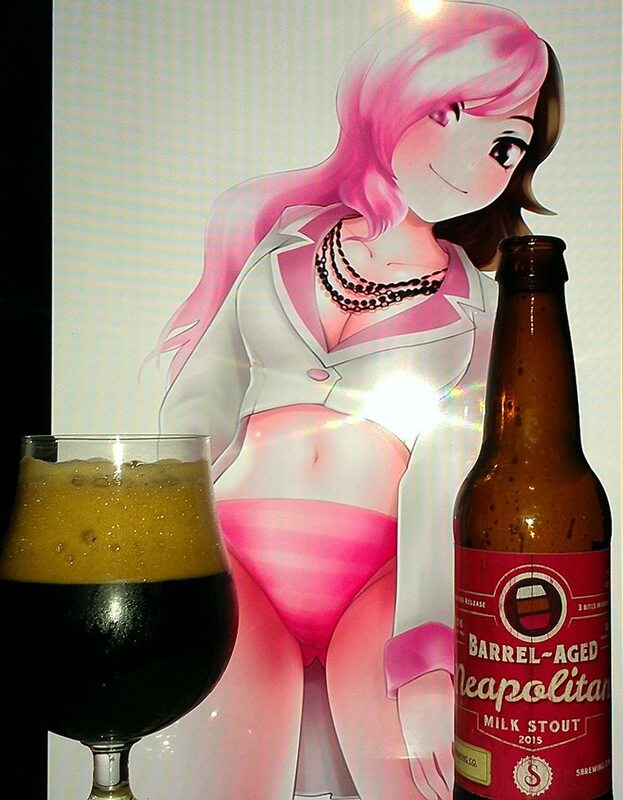 A while back my friend Aaron had mentioned something about a Neapolitan ice cream beer that I wanted to try out. I was unable to find it until I checked www.mybeercollectibles.com and saw this one for a very small price. I figured I go for it as I don’t think I would have found it anyways. The idea of a Neapolitan ice cream and beer was mind blowing. It is an idea that makes me want to actually make a recipe like this. Anyway, let’s see what this brew has to offer. Cheers! Rich Milk shake, Neapolitan ice cream, cotton candy, chocolate, vanilla and strawberry shake, marshmallows, hazelnut nectar, almond joy, pecans, cookie dough, Danish cream, Glazed and cream filled doughnuts, crème brulee, dark chocolate, milk chocolate, graham crackers, Irish cream coffee, spiced coffee, bananas, clove spice, cinnamon, pecan pie, Double Chocolate fudge cherry cake, flan, three milks/3 leches cake, brown sugar and sweetened condensed milk. Rich Neapolitan ice cream, crème brulee, cotton candy, raspberries, cherries, coffee cake, steamed milk sweetened condensed milk, dark chocolate, milk chocolate, chocolate, vanilla and strawberry shake, marshmallows, hazelnut nectar, almond joy, pecans, cookie dough, Danish cream, Glazed and cream filled doughnuts, oak, bourbon, dulce de leche caramel, graham crackers, Irish cream coffee, spiced coffee, bananas, clove spice, cinnamon, ginger hints, molasses, anise, Double Chocolate fudge cherry cake, flan, three milks/3 leches cake, dark fruit raisins, currants, and more. Leaves with rich chocolate, milk shake, vanilla, strawberries, dark fruit, mild spicy notes, oak and bourbon hints. No alcohol in the taste. Dark full body, smooth, velvety and creamy mouthfeel with an easy to moderate drinkability. Like an unbelievable frothy Neapolitan ice cream. 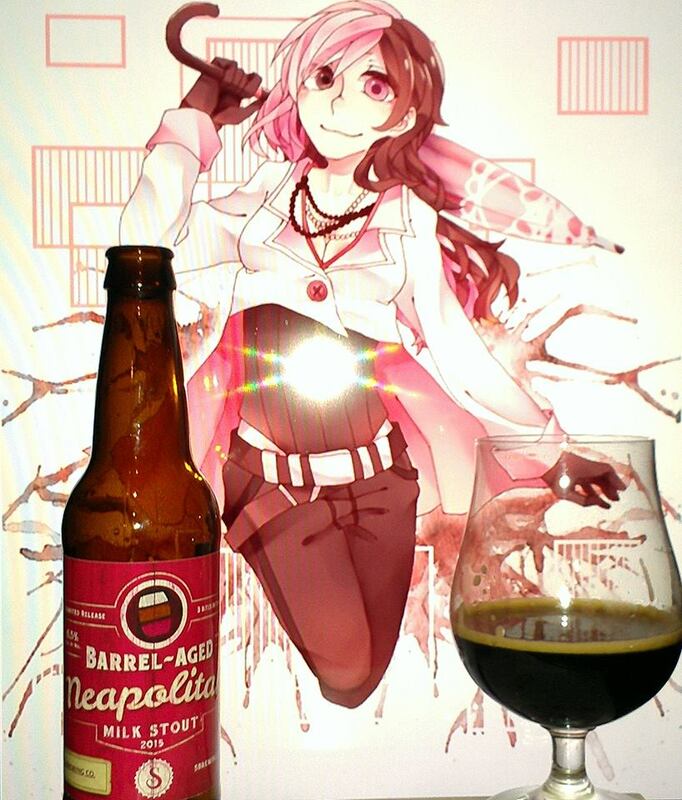 Whatever they did to get this beer to be like Neapolitan, they did it. It is literally a liquid ice cream. There’s so much flavor goodness, so much its crazy. This is definitely a must try and worth the money. I think though they should have made this one a 22oz bottle though. Now with that being said, I have to figure out how to make this brew a reality and brew my own recipe. Highly recommended. 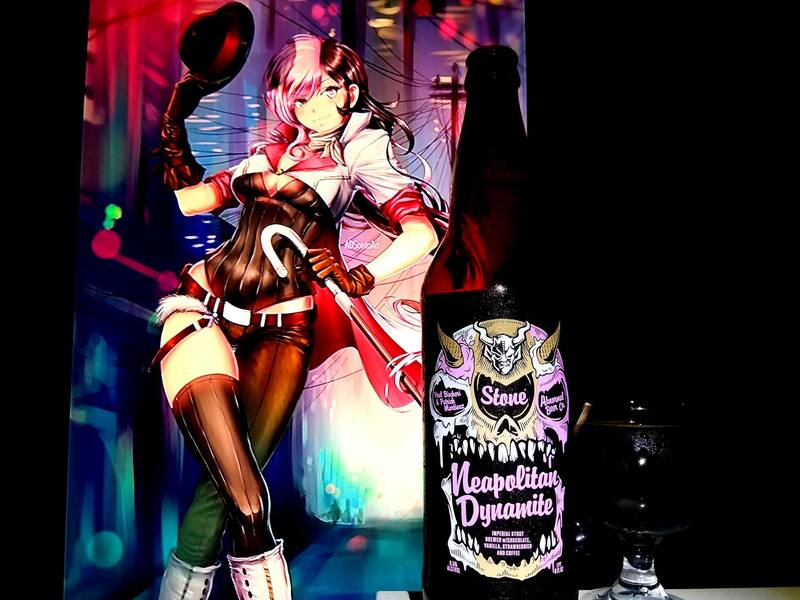 Neapolitan from RWBY was the obvious choice in this pairing. 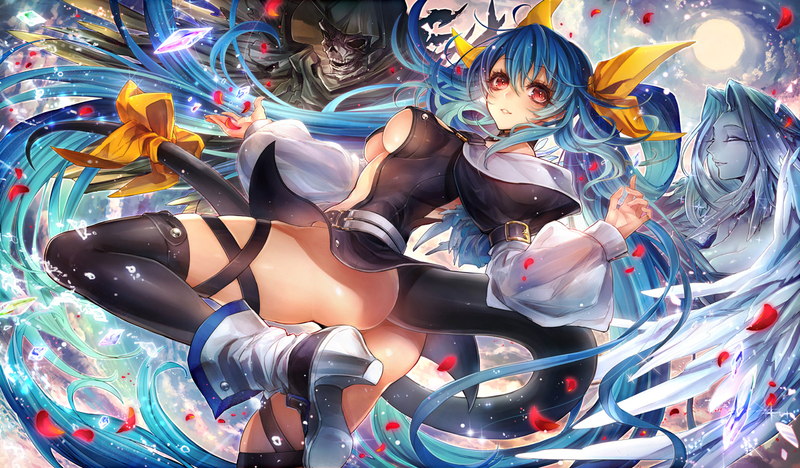 She is technically one of the Antagonists of the series. Her sweet stare is only that, sweet. 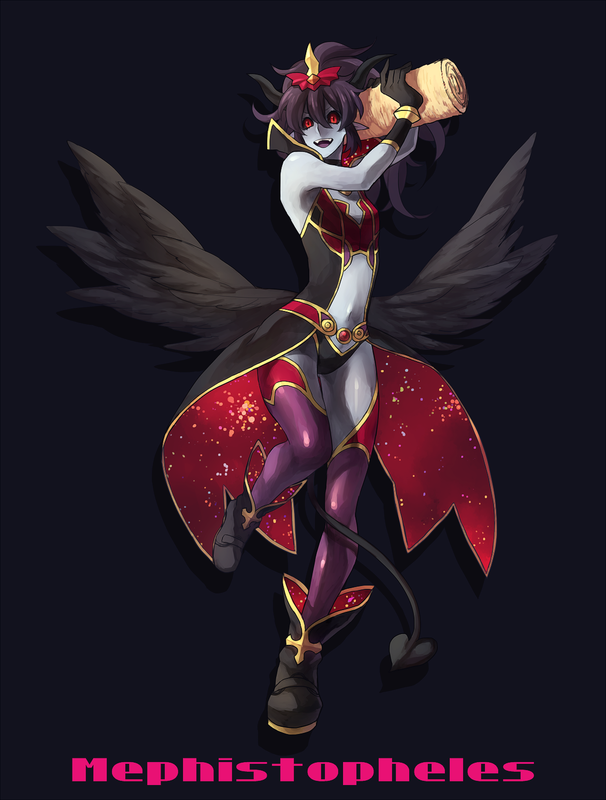 She along with Cinder are evil. She is kind of the psychotic one. 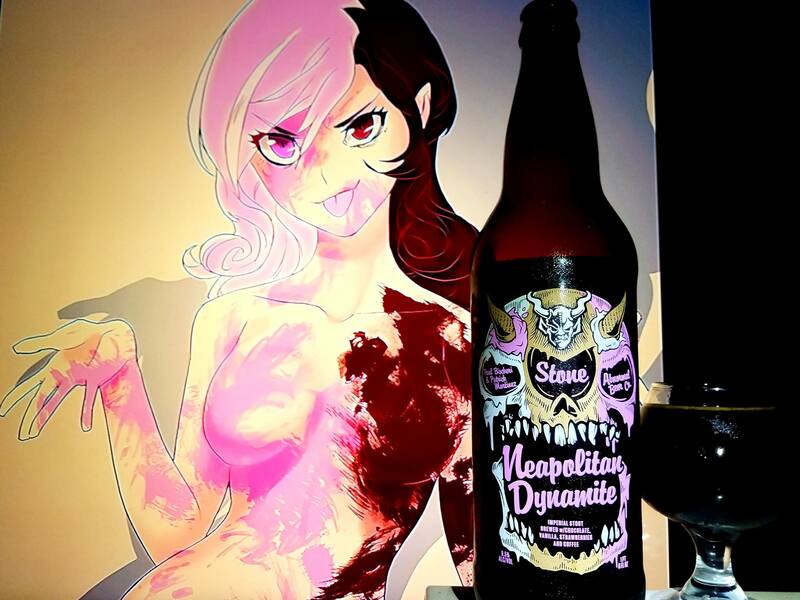 I am not sure what she has to do with the beer in terms of her personality but for characteristics, she is all over this beer, colors, flavors, label and all. 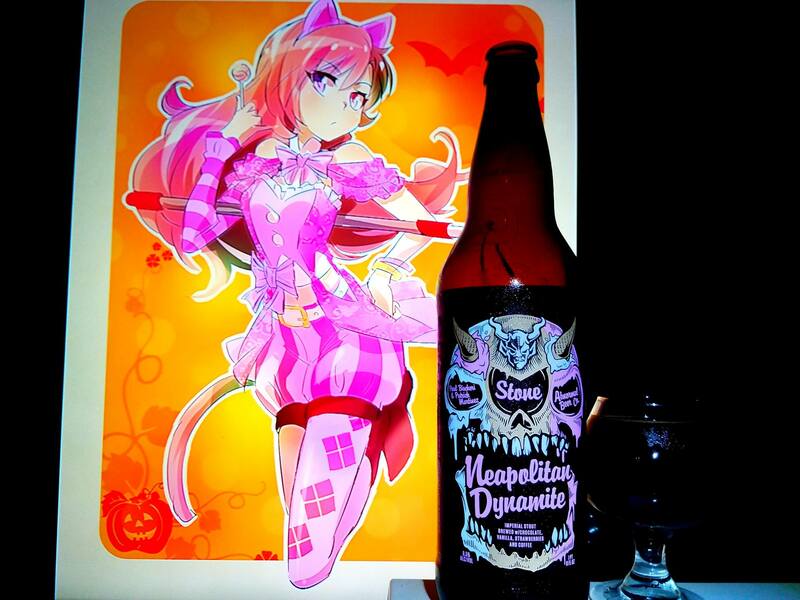 Rainbow Triplin’ by Stone brewing is an 8.2% ABV Belgian Tripel brewed with Strawberries, Oranges, Lemons, Limes & Grapes. Obtained this on as a Crowler at Stone Company Store in Pasadena for their 3rd Anniversary party. 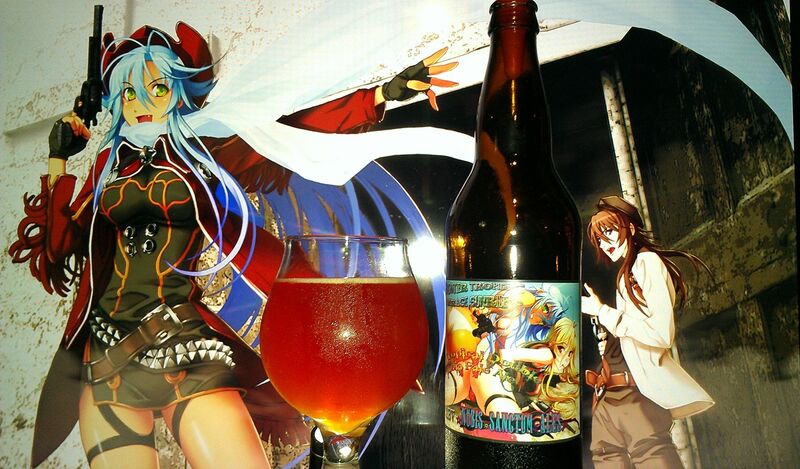 Unfortunately, I did not know much about this beer as I went there to get the Reposado Tequila Cali-Belgique. However, first taste and I was completely mind fucked and taste fucked as well (is that even a saying?). Essentially, the name was not kidding. Something about the flavors of this beer make you trip flavor wise since there is so much going on and all pointing to Skittles and tasting the rainbow. The fruity flavors are super forward like Skittles candies. So, I was able to bring this one for the review but just trying this beer makes me wonder how to get a home brew to be like this? Time will tell, for now, let me tell you about this beer now that I was able to get a Crowler of this. Super rich fruits, Starburst candy, Skittles, Floral Fabuloso Lavender, dark cherries, strawberries, tart cranberries, pomegranate, pink lemonade, lemon drop candies, peaches, limes, grapes, peppercorns, vanilla, gummy bears, oranges and all sorts of tropical fruit. Lots of Skittles flavors, Mango, tangerine, lemons, pink lemonade, lemon drop candies, peaches, limes, grapes, grapefruit, pineapple, dark cherries, strawberries, tart cranberries, pomegranate, blue berries, oranges, honey dew melon, papaya, kiwi, passion fruit, dragon fruit, biscuit bread, herbal and floral hops, hibiscus, lavender, sour apples, white raisins, peppercorns, Belgian candy sugar, ginger spice, lychee, gummy bears, gummy works and mint. Finish somewhat dry with lots of citrus and berry flavors forward including Tart cherries, lemon, lime, grapes, Oranges and grapefruit. No alcohol in the taste, light to medium pink and gold body, crisp, clean, smooth and refreshing mouthfeel with a super easy drinkaility. 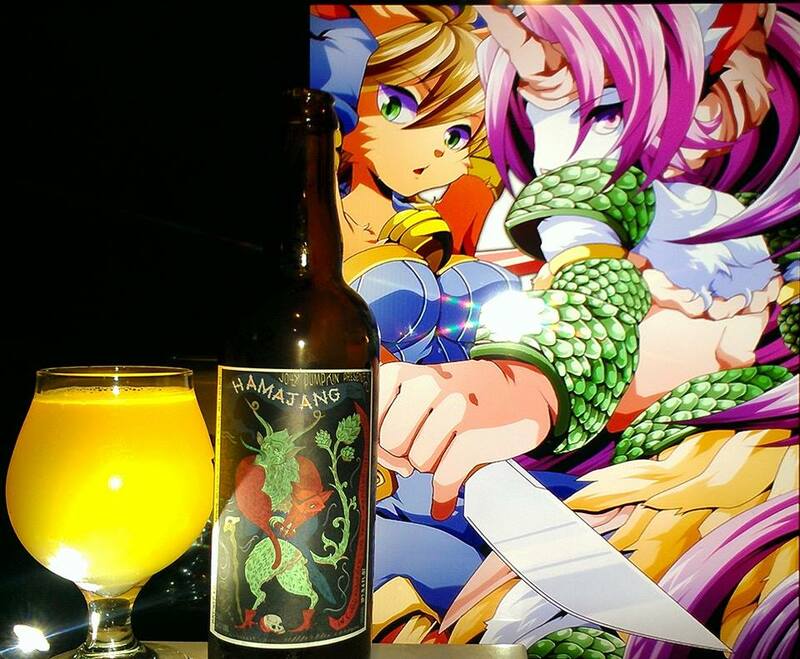 There is a reason why this beer is a real trip as you get punched in the face with a lot of tropical fruits. A perfect tropical, and more importantly, skittles Tripel. Essentially trying to figure out all the fruit flavors in this beer is a real trip as well. Wonder how they were able to get so much fruit flavor from this beer. It is pretty crazy. If you ever get to see this on tap, you definitely want to do yourself a flavor and taste that damn rainbow! 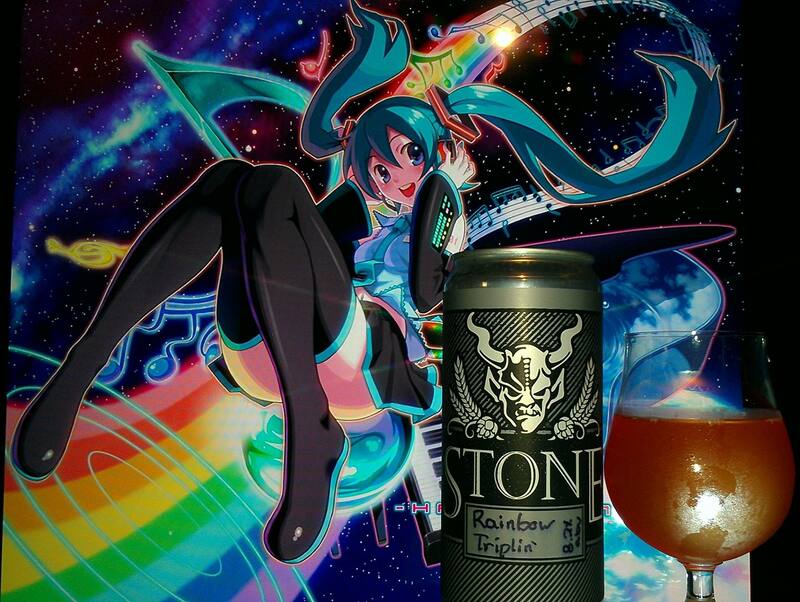 Vocaloid Hatsune Miku was used in this pairing as I wanted to find a picture that related rainbows with a “trippy” piece of art. 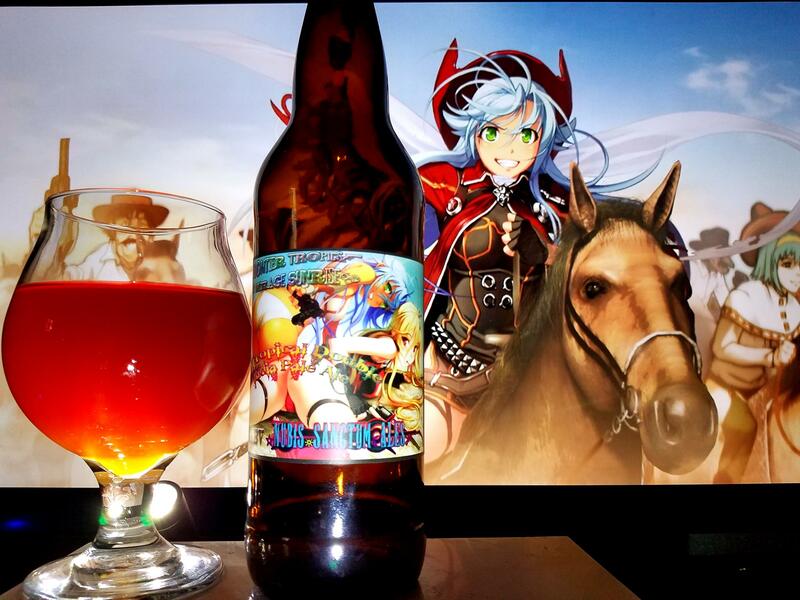 As she rides the rainbow, it is like saying, she rides the rainbow across your taste buds is like music to the taste budal ear. Super fresh, super fruity, super trippy! !